Controversy has been brewing since the changes were proposed last November. Some experts argue that the new interpretation will put women at a clear disadvantage in a culture in which marital homes are traditionally provided by men (and in many cases, by their parents). As a result of the new rule, divorced men get to keep houses whose values will undoubtedly skyrocket in China's booming real estate market. Their ex-wives, meanwhile, won't be entitled to any compensation, despite their contributions  financial or otherwise  to the marriage. Supporters of the new legal interpretation, though, believe the changes will offer a bit of financial protection to men and women  and their families  as divorce rates are rising sharply across the country. Divorce is still not as common in China as it is in the West, but the numbers have gone up for seven consecutive years. In 2010, a total of 2.68 million couples applied for divorce, an 8.5% increase over the year before, according to the Ministry of Civil Affairs. Beijing has the country's highest divorce rate, with 39% of marriages ending in a split, followed closely behind by Shanghai. As the debate rages on, some fear the Marriage Law changes could drive property prices up even further in China's already overheated market. According to a survey conducted by the online portal Sina.com after the new law went into effect, nearly 60% of respondents said they would consider buying a house on their own before marriage to avoid any problems after a divorce. Other couples, however, are seeking to circumvent the Marriage Law interpretation by registering both of their names on property-ownership certificates, making the marital home legally shared property. The government has helped to encourage this by eliminating taxes on adding a spouse's name to a property deed  a policy it announced at the beginning of September. 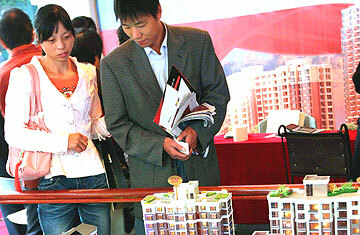 Read about the boom of Chinese matchmakers.